Today, the time has gone when you need to go to your banks and stand in long queues to check your bank balance. Now almost every Indian bank is providing a missed call banking facility. With this facility, customers can avail banking services by just giving missed call on some toll-free numbers. Apart from verifying their account balance, these services include balance inquiry, account statement, mini statement, cheque book request and much more. However, these services may vary from bank to bank. Are you standing in a long queue for balance inquiry? Tired of bank visits? Not anymore. This way you get detailed information on your registered phone numbers instantly. Another biggest advantage of using this service is that you can get your bank details anytime and anywhere. All you need to do is to dial the number from your registered phone number. Banks offer different numbers for different services. 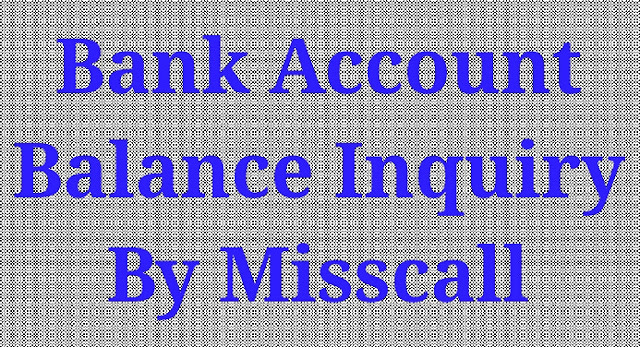 For instance, if you have a bank account in Dena Bank then for balance detail you need to dial 09289356677 and for a mini statement, you need to dial 09278656677. The call will automatically disconnect after the first ring and you will receive an SMS in within 4 to 5 minutes. Banks do not charge for this service however it might cost 15 ₹ per quarter when you avail it for the first time. Moreover, this service is completely secure and no transaction can take place using this service. For your convenience, we have added some of the toll-free numbers of government sector banks that offer missed call banking facility.